With Stouffer's Beef Base No Added MSG, quality meat and stock is the first ingredient. Freshly roasted beef with vegetable overtones is the predominant flavor. Ideal for a hearty beef gravy and brings a mouth-watering flavor to your ground meat dishes and casseroles. 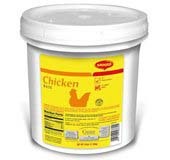 Pack size is 1 case of 12 tubs at 1lb. 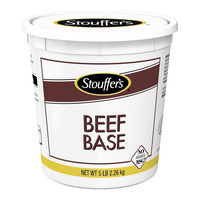 Each Stouffer's Beef Base is a delicious blend of braised beef and beef stock. 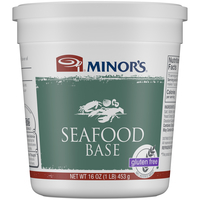 To enhance scratch stocks, add Base to reach desired flavor level. To make an instant flavorful stock/broth, add Base to water and stir: 3/4 tsp Base + 1 cup water or 1 Tbsp Base + 1 qt water or 1 lb Base (container) + 5 gallons water. To enhance scratch stocks, add Base to reach desired flavor level. 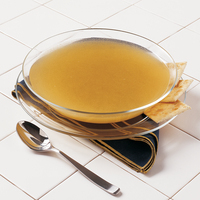 To make an instant flavorful stock/broth, add Base to water and stir: 3/4 tsp Base + 1 cup water or 1 Tbsp Base + 1 qt water or 1 lb Base (container) + 5 gallons water. Storage Temperature: Refrigerate for Optimum Flavor. Shelf Life in Days: 365 days from manufacturing date.